St. Isaac Jogues Parish was organized in July, 1956 on a six and one-quarter acre tract of land on Golf Road just west of Washington Avenue. This property had been purchased by the Archdiocese in 1954 as the site of a future parish. The 280 families who made up the nucleus of St. Isaac Jogues Parish had previously attended Mass at St. John Brebeuf Church in Niles, St. Martha Church in Morton Grove, Our Lady of Perpetual Help in Glenview, or St. Mary Church in Des Plaines. Rev. Leo M. Spring, a former assistant at Blessed Sacrament Church in Chicago, was named pastor of the new parish which embraced parts of villages of Morton Grove, Glenview, Niles, as well as unincorporated areas of these three suburbs and nearby Des Plaines. The parish property of St. Isaac Jogues did not become a part of Niles until February 28, 1978 when it was annexed to the village. Father Spring celebrated Mass on July 22, 1956 in Notre Dame High School for Boys in Niles. Thus began a working relationship with Holy Cross Fathers which has continued through the years. Fr. Brinker has been part of our parish family for the last 46 years. A house at 221 Washington Road in Glenview was purchased for use as a rectory and plans were made for permanent church quarters. In February 1957, construction began on a combination church and school building at 8101 Golf Road according to the plans of architect, Leonard Gliatto. The Sisters of Christian Charity opened St. Isaac Jogues School on September 16, 1957; Mass was celebrated in the new church quarters for the first time on November 24, 1957. Enrollment in the parish school increased so rapidly that in 1958, a farm house east of the parish property was rented as a temporary convent and the Sisters' living quarters in the ranch-style school were remodeled into classrooms. Still, the number of school-age children increased and in 1959, a 10 classroom addition was constructed. 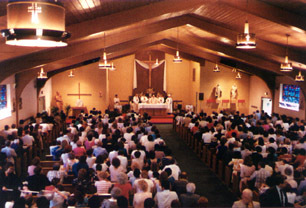 Archbishop Albert G. Meyer dedicated the new parish complex on May 24, 1959. As in other post World War II parishes, enrollment in St. Isaac Jogues School skyrocketed, from 350 students in 1957 to 1,256 students by 1962. To finance the construction of more classrooms as well as a much-needed convent, a $350,000 fund raising campaign was begun in 1962. Through the generosity of families in St. Isaac Jogues Parish, an addition was built which included eight classrooms on the first floor. This project, known as the Junior High School Wing, was completed in 1963. This wing now serves our parish as meeting rooms and offices. Enrollment in St. Isaac Jogues School peaked at 1,432 students in 1964. To meet the needs of his large parish, Father Spring purchased three acres of land west of the parish buildings. However, plans to build a new church on this site never materialized. 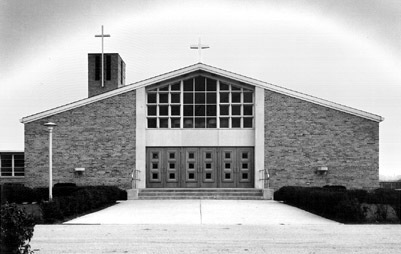 In 1960, Our Lady of Ransom Parish at 8300 N. Greenwood Avenue was established to serve Catholic families living in the western part of Niles, the northern part of Park Ridge, and the eastern part of Des Plaines. St. Isaac Jogues Parish lost the territory between Milwaukee Avenue and Potter Road. Our founding pastor, Fr. 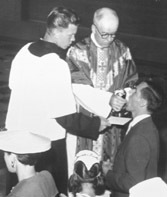 Leo Spring was named pastor emeritus in August, 1973. Fr. Spring died on November 27, 1987 in San Antonio, Texas. Rev. Elmer C. Klug was appointed pastor of St. Isaac Jogues Church effective August 8. 1973. Prior to this assignment, he served as pastor of Our Lady of Hungary Church in Chicago. Fr. Klug died on January 7, 1996 in Crystal Lake, Illinois. Rev. John C. Massion was appointed pastor of St. Isaac Jogues Church in January, 1981. In June, 1986 he resigned due to poor health. He was a resident at St. Joseph the Worker Church in Wheeling until he died on May 3, 1998. Rev. John E. Hennessey was appointed pastor of St. Isaac Jogues Church on October 10, 1986. He left St. Isaac Jogues Church in June, 1997 since he was appointed pastor of St. Joseph Church in Libertyville, Illinois. Rev. 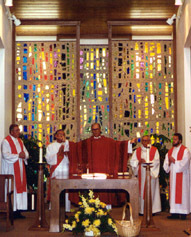 Edward R. Fialkowski was appointed pastor of St. Isaac Jogues Church effective October 1, 1997. He left St. Isaac Jogues in November 2005 when he was appointed Pastor of Our Lady of the Wayside Parish in Arlington Heights, Illinois. Rev. Andrew Luczak was appointed pastor of St. Isaac Jogues Church effective January 2006. St. Isaac Jogues Parish now serves approximately 1,800 middle income families of many different ethnic backgrounds. In June of 1992, our School merged with St. John Brebeuf School and Our Lady of Ransom School. Our Religious Education Program has approximately 250 students. St. Isaac Jogues Parish has been in existence for over 50 years. Five of its young men have been ordained priests and three of its women have joined religious orders. At present we have three permanent deacons.